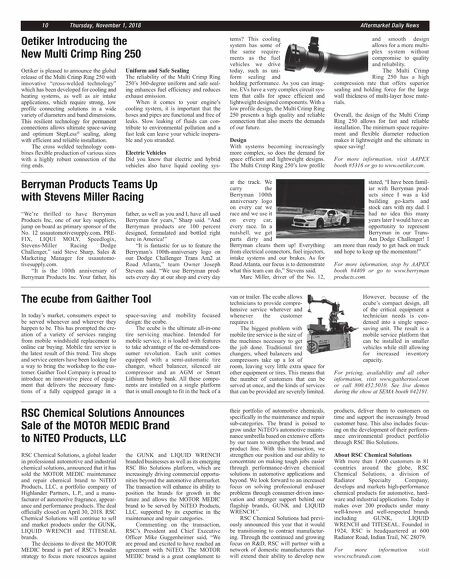 Aftermarket Daily News Thursday, November 1, 2018 1 0 Berryman Products Teams Up with Stevens Miller Racing "We're thrilled to have Berryman Products Inc, one of our key suppliers, jump on board as primary sponsor of the No. 12 usaautomotivesupply.com, PRE- FIX, LIQUI MOLY, Speedlogix, Stevens-Miller Racing Dodge Challenger," said Steve Sharp, Sales & Marketing Manager for usaautomo- tivesupply.com. "It is the 100th anniversary of Berryman Products Inc. Your father, his father, as well as you and I, have all used Berryman for years," Sharp said. "And Berryman products are 100 percent designed, formulated and bottled right here in America!" "It is fantastic for us to feature the Berryman's 100th-anniversary logo on our Dodge Challenger Trans Am2 at Road Atlanta," team Owner Joseph Stevens said. "We use Berryman prod- ucts every day at our shop and every day at the track. We carry the Berryman 100th anniversary logo on every car we race and we use it on every car, every race. In a nutshell, we get parts dirty and Berryman cleans them up! Everything from electrical connectors, fuel injectors, intake systems and our brakes. As for Road Atlanta, our focus is to demonstrate what this team can do," Stevens said. Marc Miller, driver of the No. 12, stated, "I have been famil- iar with Berryman prod- ucts since I was a kid building go-karts and stock cars with my dad. I had no idea this many years later I would have an opportunity to represent Berryman in our Trans- Am Dodge Challenger! I am more than ready to get back on track and hope to keep up the momentum!" For more information, stop by AAPEX booth #4409 or go to www.berryman products.com. The ecube from Gaither Tool In today's market, consumers expect to be served whenever and wherever they happen to be. This has prompted the cre- ation of a variety of services ranging from mobile windshield replacement to online car buying. Mobile tire service is the latest result of this trend. Tire shops and service centers have been looking for a way to bring the workshop to the cus- tomer. Gaither Tool Company is proud to introduce an innovative piece of equip- ment that delivers the necessary func- tions of a fully equipped garage in a space-saving and mobility focused design: the ecube. The ecube is the ultimate all-in-one tire servicing machine. Intended for mobile service, it is loaded with features to take advantage of the on-demand con- sumer revolution. Each unit comes equipped with a semi-automatic tire changer, wheel balancer, silenced air compressor and an AGM or Smart Lithium battery bank. All these compo- nents are installed on a single platform that is small enough to fit in the back of a van or trailer. The ecube allows technicians to provide compre- hensive service wherever and whenever the customer requires it. The biggest problem with mobile tire service is the size of the machines necessary to get the job done. Traditional tire changers, wheel balancers and compressors take up a lot of room, leaving very little extra space for other equipment or tires. This means that the number of customers that can be served at once, and the kinds of services that can be provided are severely limited. However, because of the ecube's compact design, all of the critical equipment a technician needs is con- densed into a single space- saving unit. The result is a mobile service platform that can be installed in smaller vehicles while still allowing for increased inventory capacity. For pricing, availability and all other information, visit www.gaithertool.com or call 800.452.5010. See live demos during the show at SEMA booth #42191. Oetiker Introducing the New Multi Crimp Ring 250 Oetiker is pleased to announce the global release of the Multi Crimp Ring 250 with innovative "cross-welded technology" which has been developed for cooling and heating systems, as well as air intake applications, which require strong, low profile connecting solutions in a wide variety of diameters and band dimensions. This resilient technology for permanent connections allows ultimate space-saving and optimum StepLess ® sealing, along with efficient and reliable installation. The cross welded technology com- bines flexible production of various sizes with a highly robust connection of the ring ends. Uniform and Safe Sealing The reliability of the Multi Crimp Ring 250's 360-degree uniform and safe seal- ing enhances fuel efficiency and reduces exhaust emission. When it comes to your engine's cooling system, it is important that the hoses and pipes are functional and free of leaks. Slow leaking of fluids can con- tribute to environmental pollution and a fast leak can leave your vehicle inopera- ble and you stranded. Electric Vehicles Did you know that electric and hybrid vehicles also have liquid cooling sys- tems? This cooling system has some of the same require- ments as the fuel vehicles we drive today, such as uni- form sealing and holding performance. As you can imag- ine, EVs have a very complex circuit sys- tem that calls for space efficient and lightweight designed components. With a low profile design, the Multi Crimp Ring 250 presents a high quality and reliable connection that also meets the demands of our future. Design With systems becoming increasingly more complex, so does the demand for space efficient and lightweight designs. The Multi Crimp Ring 250's low profile and smooth design allows for a more multi- plex system without compromise to quality and reliability. The Multi Crimp Ring 250 has a high compression rate that offers superior sealing and holding force for the large wall thickness of multi-layer hose mate- rials. Overall, the design of the Multi Crimp Ring 250 allows for fast and reliable installation. The minimum space require- ment and flexible diameter reduction makes it lightweight and the ultimate in space saving! 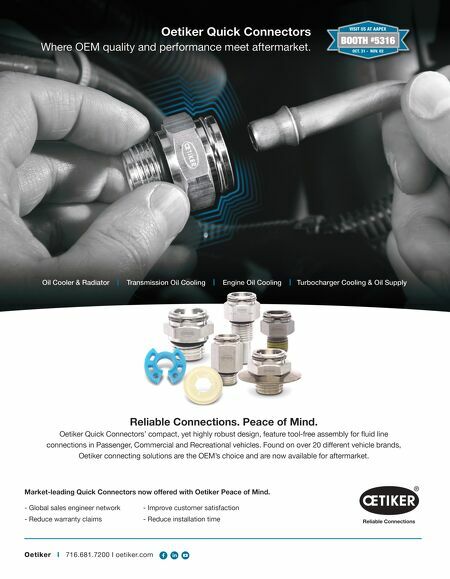 For more information, visit AAPEX booth #5316 or go to www.oetiker.com. RSC Chemical Solutions Announces Sale of the MOTOR MEDIC Brand to NiTEO Products, LLC RSC Chemical Solutions, a global leader in professional automotive and industrial chemical solutions, announced that it has sold the MOTOR MEDIC maintenance and repair chemical brand to NiTEO Products, LLC, a portfolio company of Highlander Partners, L.P., and a manu- facturer of automotive fragrance, appear- ance and performance products. The deal officially closed on April 30, 2018. RSC Chemical Solutions will continue to sell and market products under the GUNK, LIQUID WRENCH and TITESEAL brands. The decisions to divest the MOTOR MEDIC brand is part of RSC's broader strategy to focus more resources against the GUNK and LIQUID WRENCH branded businesses as well as its emerging RSC Bio Solutions platform, which are increasingly driving commercial opportu- nities beyond the automotive aftermarket. The transaction will enhance its ability to position the brands for growth in the future and allows the MOTOR MEDIC brand to be served by NiTEO Products, LLC, supported by its expertise in the maintenance and repair categories. Commenting on the transaction, RSC's President and Chief Executive Officer Mike Guggenheimer said, "We are proud and excited to have reached an agreement with NiTEO. The MOTOR MEDIC brand is a great complement to their portfolio of automotive chemicals, specifically in the maintenance and repair sub-categories. The brand is poised to grow under NiTEO's automotive mainte- nance umbrella based on extensive efforts by our team to strengthen the brand and product line. With this transaction, we strengthen our position and our ability to concentrate on making tough jobs easier through performance-driven chemical solutions in automotive applications and beyond. We look forward to an increased focus on solving professional end-user problems through consumer-driven inno- vation and stronger support behind our flagship brands, GUNK and LIQUID WRENCH." RSC Chemical Solutions had previ- ously announced this year that it would be transitioning to contract manufactur- ing. Through the continued and growing focus on R&D, RSC will partner with a network of domestic manufacturers that will extend their ability to develop new products, deliver them to customers on time and support the increasingly broad customer base. This also includes focus- ing on the development of their perform- ance environmental product portfolio through RSC Bio Solutions. About RSC Chemical Solutions With more than 1,600 customers in 81 countries around the globe, RSC Chemical Solutions, a division of Radiator Specialty Company, develops and markets high-performance chemical products for automotive, hard- ware and industrial applications. Today it makes over 200 products under many well-known and well-respected brands including GUNK, LIQUID WRENCH and TITESEAL. Founded in 1924, RSC is headquartered at 600 Radiator Road, Indian Trail, NC 28079. For more information visit www.rscbrands.com.